The eighth edition of the New Jersey Environmental Law Handbook has been thoroughly rewritten and updated. Each chapter incorporates both a theoretical and practical approach to ensure that you get the best and most actionable information possible. The authors are all respected attorneys, consultants, and professionals, and all experts in their fields. They come together in this book to provide the most in-depth and up-to-date guide for New Jersey's environmental regulations and policies, all while maintaining an accessible and engaging writing style. 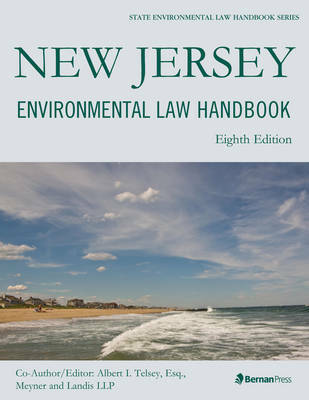 This new edition reworks the State Environmental Law Handbook Series from the ground up, beginning with an overview of the environmental law program in New Jersey, and moving on from there to discuss a variety of issues, such as contaminated property, finance and insurance, litigation, enforcement, and protected lands. Separate chapters treat air and water quality in depth, and further chapters treat hazardous waste, nuclear energy, health and safety, wildlife protection, and sustainability. This book has been completely rewritten to provide a useful and comprehensive reference work that you can rely on for up-to-date and accurate information on New Jersey's environmental laws.